The TAC A2 Glove from 5.11 Tactical is a tough all-purpose glove capable of taking on the toughest missions possible. 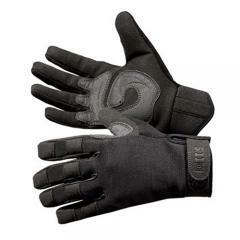 Its ruggedized body features reinforced finger joints along with other key stress points to ensure the glove does not come apart in the middle of a mission. Synthetic leather is used to line the palms and fingers, ensuring a secure grip on virtually any surface. For added comfort the back of the TAC A2 is fabricated from a breathable stretch nylon that encourages greater air circulation. A sweat wipe on the rear of the thumb comes in handy when no rags are present.